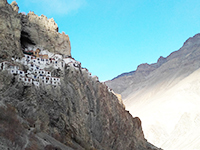 Zanskar valley is considered as one of the most adventurous and a fascinating one. Zanskar can be reached by road and by trek in summer. If you go by road, it takes two days to reach to Padum.Leh-kargil (235kms) and kargil-zanskar (230kms) Approximately 465 Kms. 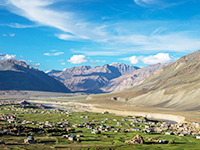 Zanskar valley is situated south west of Leh and south East of Kargil. The road from Leh to kargil is well built with mettle road and from half way between Kargil and Zanskar, the terrain is quite rough and full of magnificent flora & fauna sights. The landscapes are wonderful with different shapes and colors of the mountains, rocks and boulders. One can also have the opportunity to see the large glacier on the way. You can also rest and enjoy the cool breeze of this exotic region. Its unique high passes and the valleys, crystal clear streams and green meadows are very attractive, especially to nature lovers. There are many trekking routes within zanskar itself. Most of the trekkers love taking these routes because its very natural and they get a chance to explore the unique tradition, rich culture and heritage values of the valley. They also get a good opportunity to mingle with the smiling, good natured and peace loving people of Zanskar. In the end, they have an unforgettable memory of the visit. At Mindruk trek & Meditation, we handle all sorts of Treks, cultural tours, Monastic sightseeings, organized Meditation sessions, Jeep safari and Expedition Acts.